I recently shuffled my entire office around. Why? Because it was time for serious change. 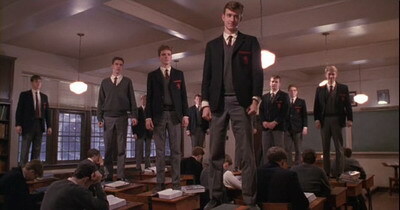 Remember that scene from Dead Poet’s Society, where the teacher, played by Robin Williams, gets the kids to stand on their desks so they can see the world in a different way? Yeah, it’s like that now. Only more so. Now, it doesn’t have to be as drastic an exercise as it was for me (it was a solid two day job, shifting everything in my office somewhere new). Often just reversing a couple of pieces of key furniture, or turning a single chair to face a different direction can give you a whole new perspective on life. I had a friend who used to completely rearrange his bedroom every six months. At the time I didn’t really understand it, but now I see what a clear message it sends to our brains. You do have influence in your environment! You can make things exactly how you want them! If you’re unhappy, change it! Even more essentially, it keeps things fresh, it makes you feel at a very deep level like you’re making a new start – and sometimes that’s exactly what the doctor ordered.